The mission of Hope Faith is to share the love of Christ by providing basic human needs including food, clothing, medical and social service intervention. Through His example and provision we will strive to provide services to facilitate self-sufficient and independent living in an environment which promotes personal dignity. 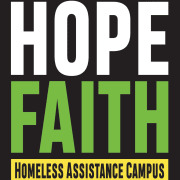 Established in 2004, Hope Faith Homeless Assistance Campus is Kansas City, MO's only daytime outreach to the homeless. Hope Faith is a full-service, not-for-profit day center for those experiencing homelessness. Hope Faith provides essential services that are available six days a week. Hope Faith works to alleviate homelessness and poverty in KCMO by providing basic necessities and assistance, as well as, providing critical services and programs to empower individuals experiencing homelessness and at-risk individuals to become self-sufficient and independent. The campus provides for immediate needs such as food, showers, clothing, laundry services, case management, and other essential services. In addition, Hope Faith provides office space(s) and operational support for on-site partners that provide medical, dental, vision and mental health services as well as additional case management resources. The campus is in continuous collaboration with external partners and service providers to offer the best possible solutions to empower individuals and break the cycles of homelessness and poverty. Would you recommend HOPE FAITH?